Item #41108 – Commemorative cover honoring the Red Baron. Richthofen began World War I as a cavalry reconnaissance officer on both the Eastern and Western Fronts. But once the fighting slowed with the advent of trench warfare, Richthofen was bored and wanted a post with excitement, so he transferred to the German Air Force in May 1915. He was one of the first members of its elite fighter pilot units. A fast learner, Richthofen embarked on his first solo flight after just 24 hours of flight training in October 1915. On September 17, 1916, Richthofen scored his first confirmed aerial victory over Cambrai, France. 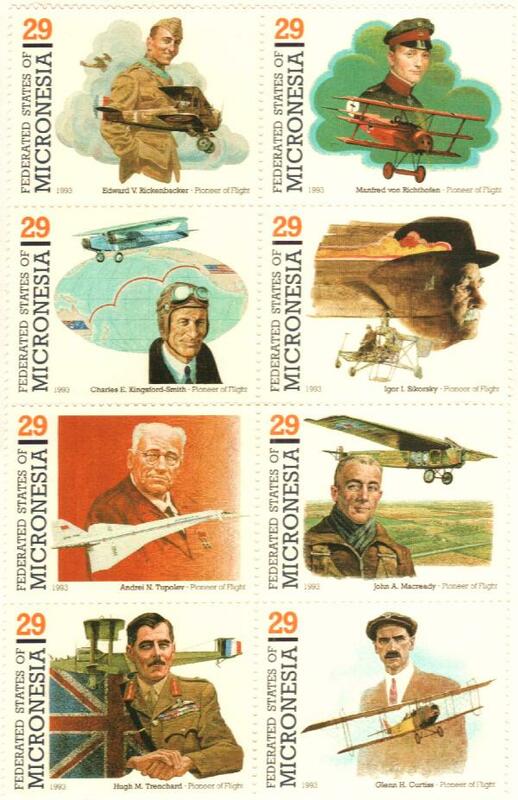 Micronesia #155a-h – Pioneers of flight stamps including one honoring Richthofen. In 1917, Richthofen began flying his famous red Fokker Dr.I triplane. That same year he was made commander of the “Flying Circus,” a unit of Germany’s top fighter pilots that could quickly reach any part of the Western Front where they would be needed. 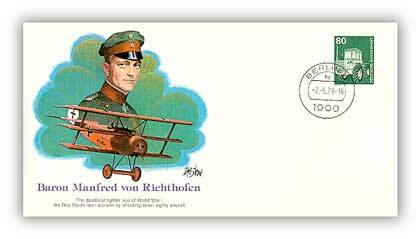 In July 1917, Richthofen was struck in the head with a bullet while flying. He managed to recover and land his plane and returned to service in a matter of weeks. By early 1918, Richthofen was such an important figure to the German public that many feared his death might be a major blow to the German people. But he couldn’t be convinced to take a ground job. On April 20, 1918, Richthofen shot down his 79th and 80th planes, the most of any pilot in the war. 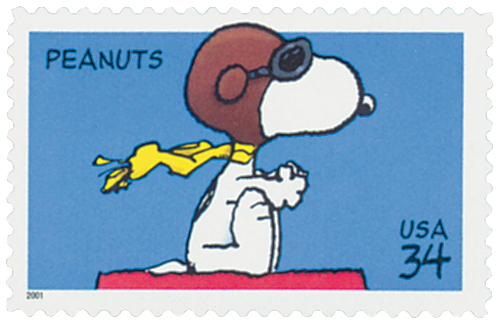 US #3507 – In the Peanuts comic, Snoopy often climbed atop his doghouse and imagined it was a Sopwith Camel battling the Red Baron. Then about 11:00 the next morning, Richthofen’s plane was shot down over the British line and he died from his wounds. The British troops buried him with full military honors there. His body was later exhumed and buried with his family in Wiesbaden. Richthofen was the war’s most successful and famous ace on both sides. 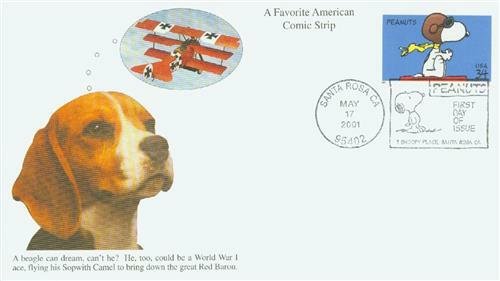 US #3507 – Mystic First Day Cover picturing a real-life beagle imagining a dogfight with the Red Baron. Click here to read excerpts from Richthofen’s autobiography. 7 Responses to "This Day in History… April 20, 1918"
“80 men tried and 50 men died, now the’re buried together on the countryside”. kudos to Snoopy. of all the Russias but died before 1912 and Nicholas II was Czar. Three cousins ruled the great Empires in 1912, Wilhelm II, Nicolas II and George V of England. Great information. Please keep up the great work. P.S. check your facts first. Great story about Richhtoven! I wonder what he would think of today’s fighter aircraft. The Snoopy stamp is a good one, especially since he was into the “dog” fight. I believe it was a Canadian RAF pilot who shot down the Baron. Thanks for the story! For that matter thanks for all you do, Mystic. Yes. In fact he was shot down by a Captain Brown flying a Sopwith Camel. Check your facts, the Barron was brought down by ground fire.